First, get all your ingredients ready. I always really try to do this before I start a recipe. Although I ~think~ I'm carefully reading the recipe, I often times forget something. This time I forgot to dock the crust before baking. No big deal, but leaving out an ingredient can make all the difference in how your goodies will turn out. I only use Guittard butterscotch chips. They are the only brand I can find where I live, so I'm lucky. You can also purchase them from King Arthur Flour or buy directly from Guittard. Preheat the oven and prepare your pan. I used the foil method and it worked out great. Set this aside while you pull together the crust. Make the crust in a stand mixture. Beat the butter, brown sugar, and 1 tbsp Bourbon on medium speed for about 2 minutes. Just mix until well combined (not light and fluffy). Decrease the mixer speed to low and add the flour mixture in large spoonfuls. Mix just until combined. I forgot to photograph this part, but it's very similar to making cookie dough. Next, lightly press the dough evenly into the pan. Don't press too hard or your crust will be tough. Just enough pressure to pull it together. Poke holes in the dough with a fork. [Note, I forget to dock the crust and all went well). Bake as directed. Mine took 30 minutes. Melissa's recipe called for 35-40 minutes, which would have been too long in my oven using the glass pan. 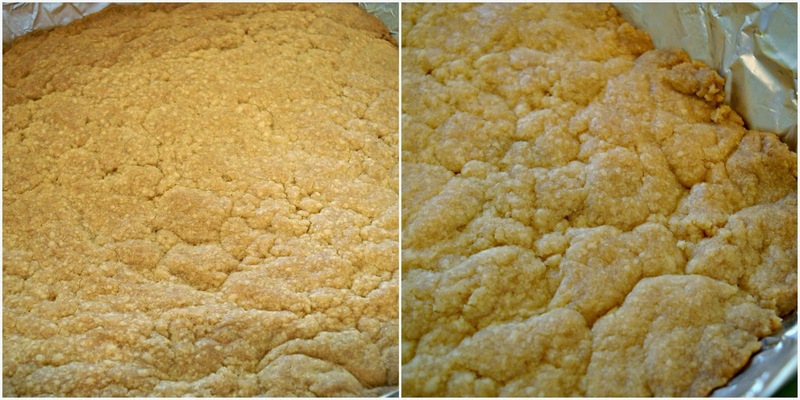 Rotate the pan half-way and continue to bake until the crust is a golden color. 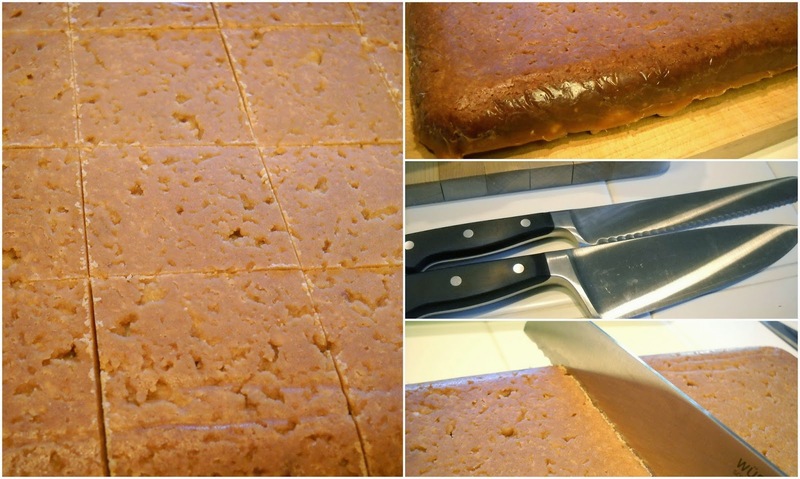 Remove to a wire rack to cool while you make the butterscotch bourbon caramel. Yum. I don't know about you, but I don't think I could handle measuring certain sticky ingredients, like corn syrup, without my Wonder Cup. Truly, a thing of beauty. Carefully pour the butterscotch bourbon caramel over the crust. It's very hot and will burn, so be careful with this pan of very hot sugar! 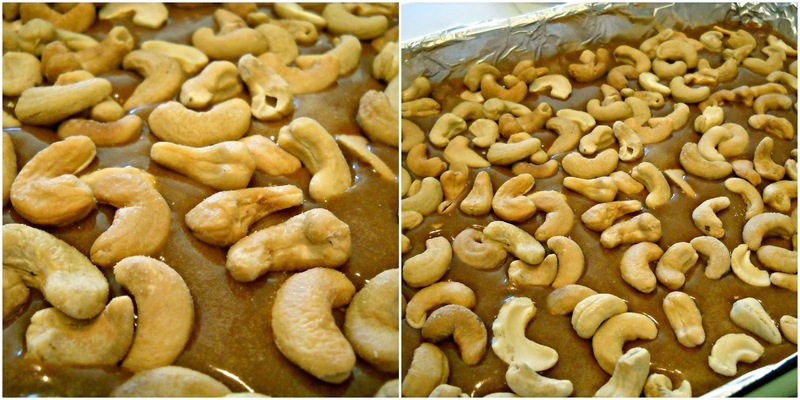 Sprinkle the cashews over the caramel layer. Then, return the pan to the oven and bake for 5 minutes. 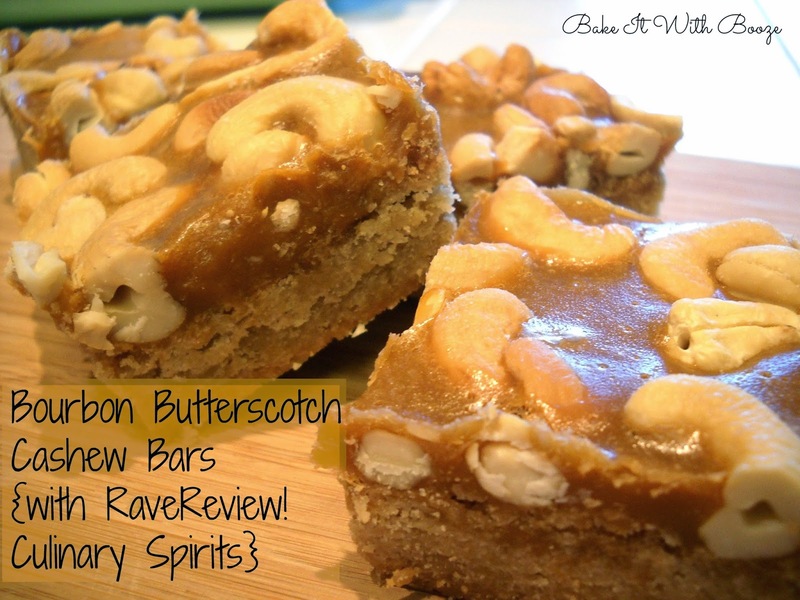 Remove the pan of butterscotch cashew greatness and cool completely on a wire rack. I let mine cool overnight and did not refrigerate. Once you are ready to cut these into bars, remove the entire block of bars from the pan using the the foil handles (or parchment) from pan. Place on a cutting board. Invert on the board and remove all the foil. You can proceed with cutting the bars as you like. However, I opted to use Melissa's method for cutting these bars. 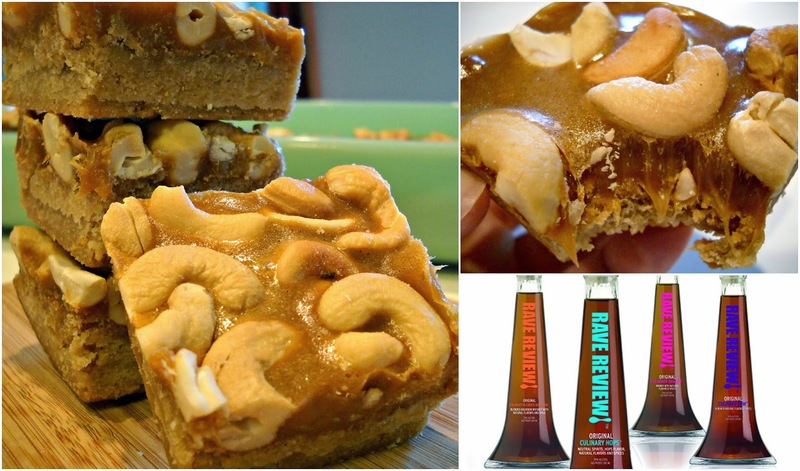 It's super easy and you get perfectly cut bars with no cashews sinking into the caramel layer. First, invert the entire sheet of bars and score the bottom of the crust with a serrated bread knife. Next, using a straight edged heavy chef's knife, cut though the crust, caramel and cashew layers. This method worked like a champ and no nuts crushed into the crust! Finally, a neatly cut bar all ready for a photograph! Last step: flip over the bars and place in a sealed container, with wax paper placed between each layer of bars. The filling will remain soft at room temperature and might ooze a bit. Not enough oozing to be scary, just nice oozing. I did not refrigerate these, but you might want to if you're not eating them soon. I also froze a few bars, wrapped individually in plastic wrap, and they thawed wonderfully well. I brought these into work becasue I really can't have this volume of luscious bourbony bars around the house...A BIG hit at work, too. So, lots of taste testers agreed that these were a winner. 1. Preheat oven to 350°. Spray a 9x13″ pan with cooking spray. Line the pan with foil making sure that the foil hangs over the short ends of the pan. You’ll need that extra to lift the bars out of the pan. [Note: You can also use two sheets of parchment paper, and line the pan’s width and length, thus creating a parchment “sling.”] Spray the foil (or parchment paper if you are using the sling method) with cooking spray. Set aside. 2. In a medium bowl, combine the flour and salt. Set aside. 3. In the bowl of a stand mixture, beat the 1 cup butter, brown sugar, and 1 tbsp Bourbon on medium speed for about 2 minutes. Just mix until well combined, scrap bowl once. Decrease the mixer speed to low and add the flour mixture in large spoonfuls. Mix just until combined. Lightly press dough evenly into the prepared pan. Poke holes in the dough with a fork. 4. Bake for 30 to 35 minutes, rotating the pan half-way, and until the crust is a golden color. Remove to a wire rack to cool. 5. In a heavy saucepan over low heat, stir together the butterscotch chips, corn syrup and the remaining 2 tbsp (each) unsalted butter and Bourbon. Stir constantly until the mixture comes to a gentle simmer and the butterscotch chips are melted. 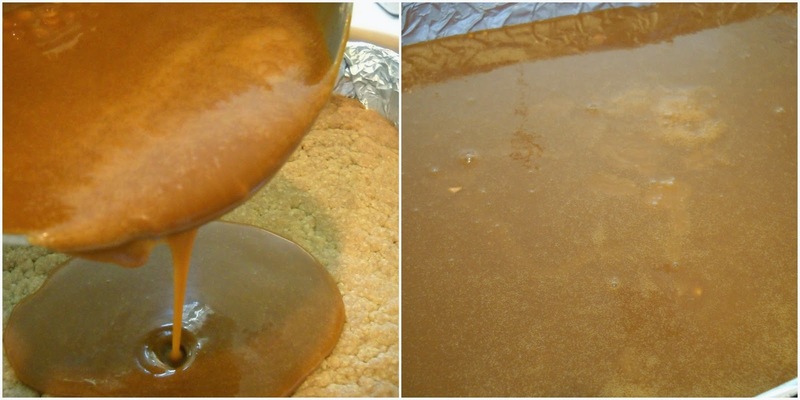 Pour the butterscotch caramel over the crust. 6. 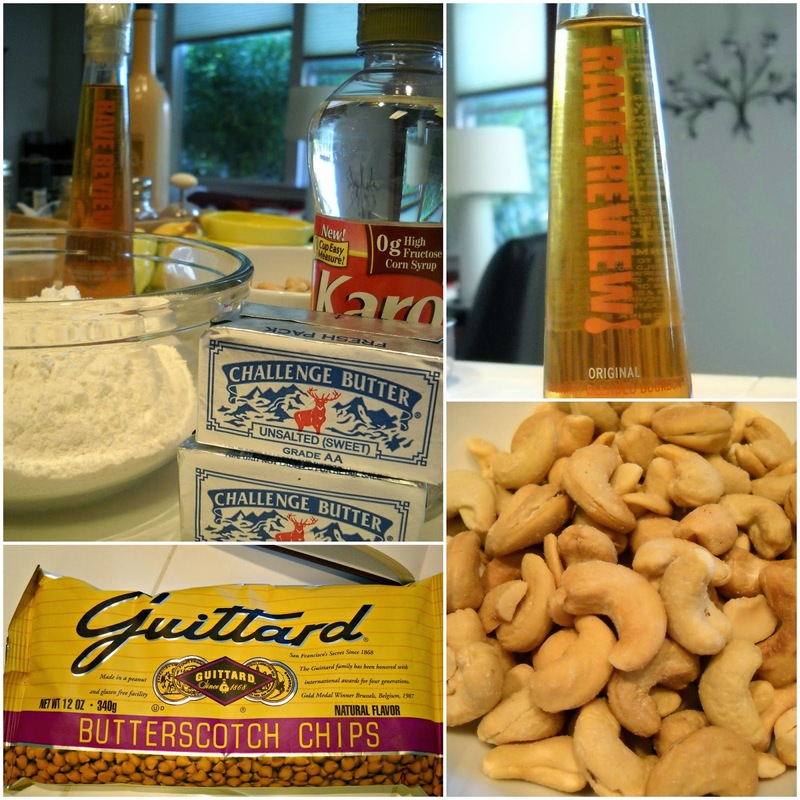 Sprinkle the cashews over the butterscotch caramel. Return the pan to the oven and bake for 5 minutes. 7. Remove the pan from the oven and cool completely on a wire rack. After cooling, remove the bars from the pan using the foil handles (or parchment) and place on a cutting board. 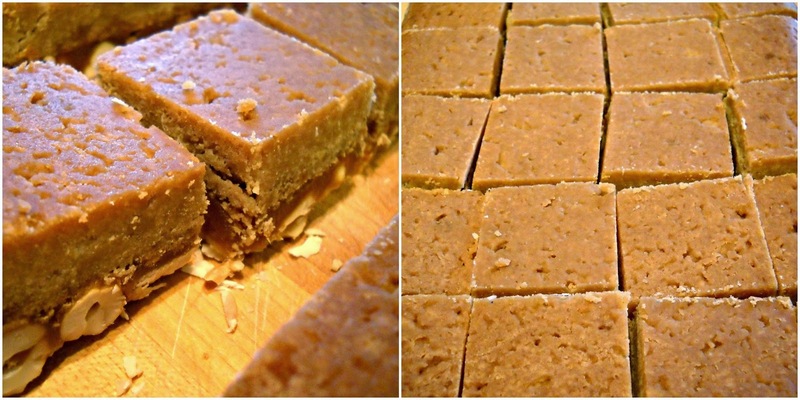 Use a sharp knife to cut into 24 bars. Note on content: RaveReviews! provided us with products to sample in our baking creations. The opinions stated here are all my own.